Illegal fireworks could literally and figuratively cost you an arm and a leg. 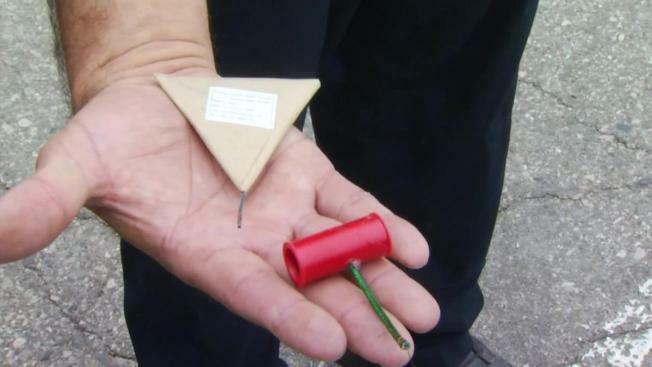 In cities and towns across the Bay Area, police departments warned of steep consequences for possession or use of illegal fireworks. Monday's elaborate festivities showed just how serious those warnings were. In the East Bay, volunteers geared up for the sanctioned fireworks show happening at 9 p.m. at Pleasant Hill Park. The popular spot was teeming with officers and event organizers on the lookout for contraband. Becky Paulson, a resident of Concord who attended the Pleasant Hill show, said she hears sparklers and cracklers in her neighborhood every year on Independence Day, right about the time the sun goes down. "It's just when it starts to get dark that we hear them," she told NBC Bay Area. "They seem to be going off all over the place in the neighborhoods." Other East Bay residents worried that the fireworks could spark a fire in the dry brush, causing a repeat of the blazes that broke out in Brentwood and Pittsburg earlier on Sunday. Fire officials have credited fireworks with sparking both of those fires. "I wish people wouldn't do that because it's so dry," said Annie Sampson, also of Concord. "It's just unnerving because you don't know where (the fireworks) are going to land." South Bay residents had similar anxieties, despite law enforcement and city councils approving a hike in illegal firework fines and beefing up security during annual festivities. Back in April, the San Jose City Council approved a measure authorizing larger penalties for the "sale, use, possession, or storage" of fireworks. According to the new measure, fireworks-related violations will cost anywhere from $500 to $1,000, depending on the number of offenses a person has already racked up. Jail time is also a possibility for offenders in the South Bay. Meanwhile, in San Francisco, police officers and security guards swarmed the pier, where the city’s largest fireworks show was slated to begin at 9:30 p.m. Although those officers were also on the lookout for illegal devices, many were stationed near workers from Pyro Spectaculars, the business charged with putting on the dazzling annual display. Fire departments were also standing guard should anyone get too close to the devices – or try and plant some of their own. The city’s police and fire units were all on high alert for possible terror attacks, but that fear didn’t seem to trouble event attendees.